Titans of the technology world are battling to win the hearts and minds of American educators. As Amazon, Apple, Google, and Microsoft make strategic moves to win access to American schools—and the schoolchildren who could be their future customers—they also pose a serious and growing competitive threat to large education-focused companies such as Houghton-Mifflin Harcourt, McGraw-Hill, Pearson, and Scholastic. 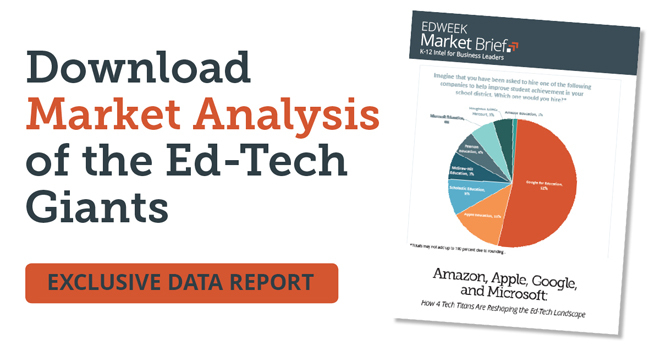 In April 2017, EdWeek Market Brief and the Education Week Research Center surveyed a nationally representative sample of teachers and administrators about these eight companies, their products, and their positions in the K-12 technology market.